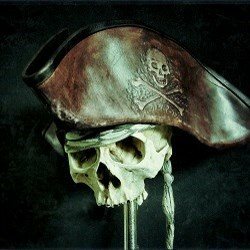 Leather tricorn & bicorn pirate hats. We're told these awesome hats are "made in England by me, a pirate's wife...yes my husband is a pirate..". How intriguing! So, the hats, made from quality leather, they're often dyed, waxed and 'aged' to give them that authentic look. Hand embossed with a skull & crossbones just to finish the look. As well as being suitable for nautical and pirate themed weddings, fans of steampunk cosplay will also enjoy these hats. Steampunkers may also be interested in the striking and utterly magnificent Dr Death Leather Plague Doctors Mask & Hood. It's certainly one of our favourites!